Intel plans to talk about its future technology and product plans at Computex, but doesn't have any big surprises lined up for the Taiwanese hardware show, which opened Tuesday. One of the biggest announcements that Intel has planned concerns a new thermal "technology concept" called Canoe Lake, which Intel says will enable hardware makers to build very thin netbooks. But executives aren't offering much insight into how the technology works. "I would rather not get into the details of the technology itself. It is a thermal technology that is an innovative way of extracting heat from the box, which then enables the form factor of the device to become much thinner," said Matthew Parker, general manager of Intel's Atom client division. At just 14mm thin, 'Canoe Lake' can accommodate both 'Pine Trail' single-core and dual-core Intel Atom-based netbooks. Canoe Lake is designed to let hardware makers build thin netbooks using Atom chips that require a fan to dissipate excess heat that the chip produces. While Intel plans to show a thin netbook concept design to illustrate how the technology could be used, Canoe Lake won't be appearing in prototypes from other companies -- a sign that commercial products based on the technology are not imminent. "There is significant interest in the industry in this technology but we won't be announcing any partnership or OEM design wins at Computex," Parker said. In addition to Canoe Lake, Intel will also announce a netbook variant of its recently announced Moorestown version of the Atom. Called Oak Trail, the Moorestown variant adds support for additional I/O technologies found in PCs, but is otherwise comparable to the Moorestown platform, which is designed for handheld devices. Most of what Intel plans to show at Computex has already been seen elsewhere. For example, the dual-core Atom chips for laptops discussed during the company's recent investor conference will figure prominently at the show, likely appearing in systems from a range of Taiwanese hardware makers. As expected, these chips will offer support for DDR3 memory, which is rapidly becoming the standard memory type found in PCs. The Atom N455 and N475 are available starting June 1 and the D525 and D425, which bring DDR3 support to desktop PCs will be available on June 21, Intel said. Dual-core Atom chips for netbooks represent a subtle shift in strategy for Intel. For the last two years, the company has said single-core Atom chips offer enough processing power for netbooks, which the chip maker says aren't meant to handle processor-intensive applications anyway. In addition, dual-core chips generally consume more than single-core variants. Until now, Intel has only offered a dual-core version of Atom for desktops. 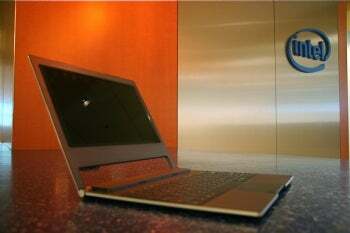 But the company said the dual-core chips will give netbooks a needed boost in performance. "As the web content and the browser content becomes richer, the dual-core will bring a better experience when enjoying rich content or multiple windows," Parker said. That might help boost Atom sales, which have slipped as a percentage of overall processor shipments even as wider demand for PCs grows. During the first quarter, Atom's share of the processor market fell four points, from 24 percent to 20 percent, compared to the previous quarter, IDC said, noting that overall processor shipments rose 4.1 percent during the period. The dual-core Atom processor could also help fend off growing competition from Advanced Micro Devices, which showed off two new Acer netbooks based on its chips at the recent Cannes International Film Festival. While netbooks have typically been designed to run basic computing tasks, AMD has focused on bringing more computing power and graphics performance to the machines. "Our OEM partners challenged us to enable a netbook form factor that provided an uncompromised Web and [high-definition video] experience, and one that could run many popular consumer applications," Nigel Dessau, AMD's senior vice president and chief marketing officer wrote in a recent blog entry. "Acer and Asus in particular asked us to enable a netbook that could be a real alternative to what is currently available in the market," he wrote.